With a large crowd gathered, the screening then switched to the serious business of ‘Growing Soybeans’ and the crowd hushed. 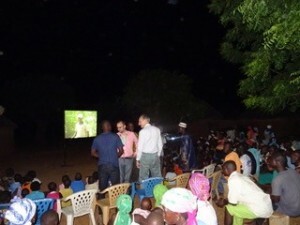 This was one of hundreds of screenings by Countrywise-Ghana to inform farming communities of good agricultural practices for soybean production. Countrywise-Ghana produce and distribute videos in two local languages based on local testimony to promote development in Northern Ghana and have been contracted by CABI who lead the Gender and Legume Alliance Project part of the DFID funded SAIRLA programme. The video covered all aspects of soybean production from seed selection, through planting, weeding, harvesting, threshing and post-harvest storage. The novel concept the video explained was inoculating with rhizobium to improve nodulation and fixation of nitrogen – that critical nutrient to all agricultural production. This combined with improved seed and a small dose of triple superphosphate (TSP) can improve both yields of soybean and the subsequent maize from the nitrogen left in the soil by the soybean. The film screenings are very good at bringing families together to get information. Of all of the communications approaches attempted by ASHC over five years, village-based screenings are the most inclusive for women and younger farmers. The screenings in each location are timed to be after the evening meal and chores are complete and the final visit to the mosque. And in addition to the timing, children are welcome at the screenings, so almost all barriers to women’s attendance are removed. Back to the village show – the video complete, there followed nearly an hour of questions from farmers skilfully fielded by the Countrywise technicians – who not only needed to know how to shoot and screen a film in villages with no electricity along a dirt track in through the bush, but also have a technical knowledge of soybean production. With questions over, participants were told that if they wished to receive more information on how to grow soybean and where to obtain the seed, inoculum and fertiliser to do so, they should register their names and mobile numbers. These would be provided to a local agricultural inputs supplier who would contact them when inputs were available. The following day we met with Green-Ef Eco-business Ltd who have worked with the GALA project to provide these inputs through their distributors. The previous cropping season they had obtained rhizobium inoculant with help of the project and offered as a package with improved seed and triple superphosphate at some of their distributors. Inoculum is a new technology in Northern Ghana and soybean is a crop that has traditionally not had any inputs applied. This accounts for the slow start to sales. Only around a quarter available inoculum was distributed last season, but interest has been generated and is feeding through to the agro-dealers. We also travelled to a regional trading town Savelugu where farmers take produce to sell and buy goods for their family and farm. We visited one distributor the owner of the Suhuvini Agro Chemical store, who explained how she provides inputs and advice to local farmers. As a member of the local agro-dealers association she explained that if they provide advice that fails, farmers have the right to make a claim against them. Our focus however was on demand and understanding of the use of rhizobium inoculant; she showed us the GALA poster explaining the technology, and how she explained the handling of the inoculant to farmers – as it is different to fertiliser. She had sold some inoculant the previous season, but the problem was the short life-span of the inoculant as it needs refrigeration which she does not have. Nevertheless, she agreed that for the next season she could arrange for the video screening to visit several farming communities she provides inputs to, and if the inputs were provided on time she thought there would be interest. 2017 saw the first information campaign of the GALA project, which is part of the broader Africa Soil Health Consortium supported by the Bill and Melinda Gates Foundation. CABI together with their partners, the IITA, the local University for Development Studies, Savanna Research Institute developed the content of these information campaigns. Then through village screenings by Countrywise they estimate to have reached 29,555 villagers in northern Ghana; with 3,000 farmers providing their names and mobile numbers to receive further information from input supplier Green-EF. Local researchers will be following up with farmers get their feedback on the technology, its effectiveness and its limitations. With better knowledge of the timing of demand and refrigeration needs for the inoculant a better service can be provided. If successful the model can be maintained through an alliance between this local public-private partnership, aiming to provide Ghanaian farmers with the inputs and services to develop a more sustainable agriculture. CABI is using this pilot as the basis for an extended programming to cover three regions of Northern Ghana in up to eight local languages. The aim is to have 300 screenings and to combine information on soybean with a new film produced by CABI on fall army worm.